If you would like to be one of our founding Sponsors or Community Partners, please touch base with us now by calling (267) 27-SCOUT or emailing Scout.Info@TroopResource.org. Here are some reasons you might consider talking with us, now! • Car Companies: Young men love talking about cars. Leaders love showing off their trucks at campouts. • Wilderness Treks/Areas: Leaders are always looking for places to take the Scouts. • Camping/Sports Companies: Umm, this one is pretty self-explanitory. What better audience than a group dedicated to camping? • Religious Organizations: Let's send these kids off on the right foot. A Scout is Reverent. • Sneakers, Clothes, Electronics, Games, and any company with a target audience of youth 11-18 (Scouts) or adults 18-35 (Leaders). 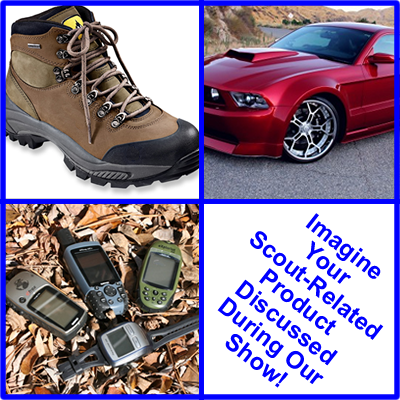 We provide opportunities for supporters and community partners to be appear on our web pages, announced during our show and provide demonstrations of their scout-pertinent products as featured segments on the show. Think about how advantageous it might be to get in on the "ground floor!" Coventry Log Homes based out of Woodsville, NH graciously allowed us to use the log cabin image in our web page header. They make great log cabins and we encourage you to take a look at their website: www.CoventryLogHomes.com. The cabin style shown is called "Bear Rock." The SansBug freestanding mosquito net tent company at www.Sansbug.org. Thank you Kathy Meloni of Springfield, PA for interviewing me for the enhanced podcast. What a great job! You made me look good. Thank you Jon Robertson for all your help producing our videos. Thank you Stephen Perrone, Dave Zimmerman and Nick Meloni for your faith and encouragement. Thank you Steve Nieman for encouraging Troop 512 to participate. Thank you Nancy J. Newman and Richard Newman M.D. for our first $100.00 donation!